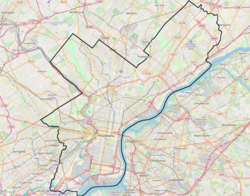 Ogontz/Belfield is a neighborhood in Upper Northern Philadelphia that is located adjacent to West Oak Lane, East Germantown, Logan, and Fern Rock, Philadelphia. According to Philadelphia Department of Records, Belfield is located in the "vicinity of Chelten and Olney Avenues, Wister Street and Ogontz Avenue. Named for the Belfield Mansion". Ogontz is "from Ogontz Avenue to Broad Street above Olney Avenue". Ogontz gets its name from Ogontz Avenue, a thoroughfare which runs diagonally through the uniform grid of streets in the city. Many of the commercial and residential properties on Ogontz Ave. began to decline in the early 1970s, but revitalization efforts have largely restored it to being an important destination for the surrounding community. Ogontz Avenue joins Pennsylvania Route 309 (old US 309), a limited access expressway, after it crosses into the suburbs. The Central High School, Special Troops Armory, and Suffolk Manor Apartments are listed on the National Register of Historic Places. Central High School, Philadelphia,Widener Memorial School, and Philadelphia School for Girls are located just south of the neighborhood. Since La Salle University is located on both sides of Olney Avenue, it is partially in Ogontz/Belfield. Imhotep Charter High School, Joseph Pennell Elementary, Ogontz Academy, and Prince Hall Elementary are all located within the neighborhood. Free Library of Philadelphia operates the David Cohen Ogontz Branch at 6017 Ogontz Avenue at Church Lane. Belfield Recreation Center, Belfield Park, and Kemble Park are located in the neighborhood. ^ "." Ogontz theater at '. Retrieved April 26, 2011. ^ "David Cohen Ogontz Branch." Free Library of Philadelphia. Retrieved on November 7, 2008. This page was last edited on 17 December 2018, at 01:49 (UTC).